Location: The Niagara River Gorge, Niagara Falls, New York. Since 1950 the volume of water passing over Niagara Falls and through the Niagara Gorge has been controlled by the hydroelectric power plants located up river of the falls. A summertime visitor to Niagara Falls now sees only half of the natural volume of the river passing over the falls and through the gorge. On winter days and every night the volume is reduced even more, to only one quarter of the natural volume. The flow of large volumes of water is measured in cubic feet per second (cfs). 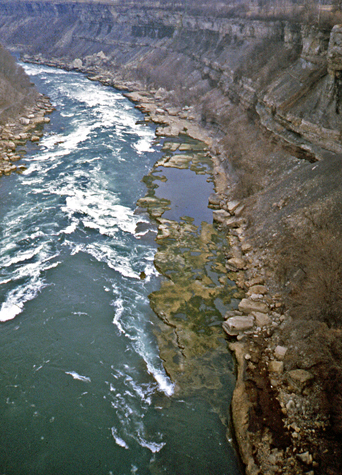 The average volume of the Niagara River is 202,000 cfs. From April 1 to September 15, between the hours of 8 a.m. and 10 p.m., the flow over the falls is reduced to 100,000 cfs. From September 16 to October 31, between the hours of 8 a.m. and 8 p.m., the flow over the falls is reduced to 100,000 cfs. At all other times the flow over the falls and through the gorge is reduced to 50,000 cfs, which is less than 25% of the natural volume. For the animation below I hiked down to a spot along the Whirlpool Rapids before the flow over the falls and through the gorge was increased at 8 a.m. I was curious to see what the increase from 50,000 to 100,000 cfs looked like and how long it took. Because of the size of the animation (10 photos) it may take four minutes or so to load. Below are the ten photos that were to used to create the animation. The time the photo was taken is below each photo. They were scanned from slides that were taken by me in August of 1982. For an ACME Mapper 2.0 satellite photo of the location where the photos were taken from click here. 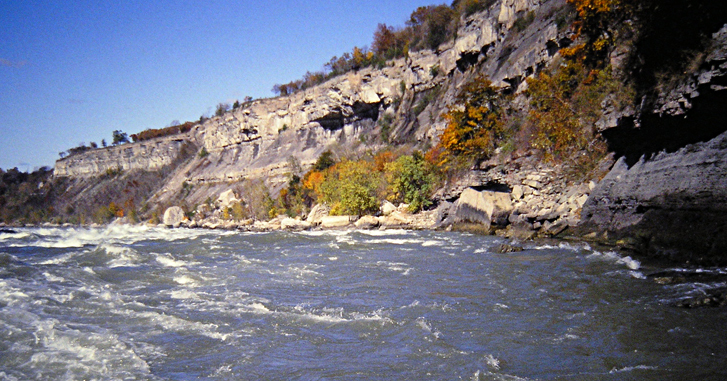 The photos above were taken from the walkway of the Whirlpool Rapids Bridge in June and March of 1983. In the June photo on the left the volume of the river is 100,000 cfs. In the photo on the right the volume is 50,000 cfs. The walkway of the bridge has been closed to pedestrians since 2002. 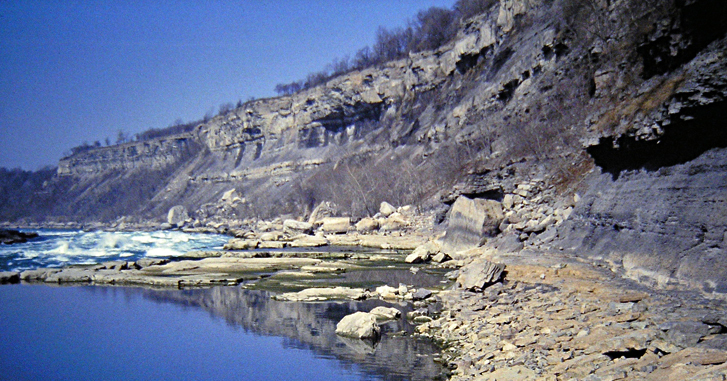 The photos above were taken from the same spot along Whirlpool Rapids in October and March of 1983. For a ACME Mapper 2.0 topo map of the Whirlpool Rapids area click here. 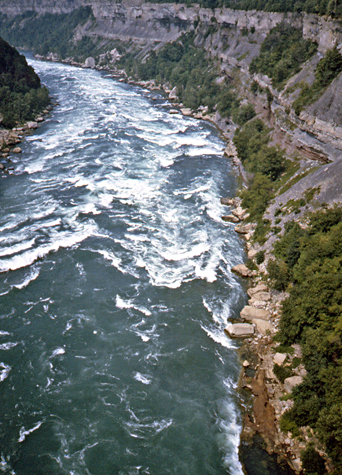 The easiest way to view the Whirlpool Rapids is the White Water Walk in Canada. It is a wheelchair accessible boardwalk that provides access to several viewing areas along the rapids. Visitors are transported to the base of the Niagara Gorge by elevator. The boardwalk is open between mid April and November. Copyright © 2010 by Scott A. Ensminger.